🦁 The most awaited Summer Camp - Zoo Ambassador of your Vandalur Zoo is here for this holiday season to educate your children through fun learning. They will spend good and memorable time with the animals at Arignar Anna Zoological Park. Register at https://www.aazp.in/summercamp from April 1st, 11am. 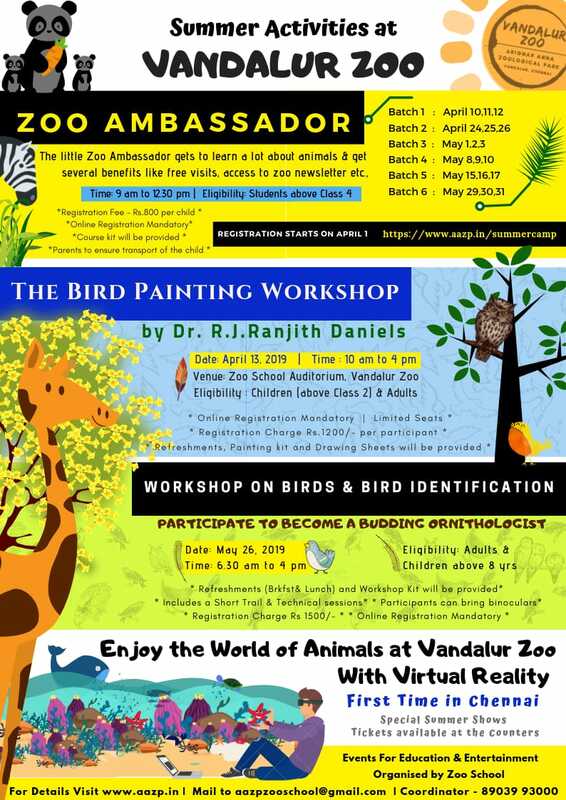 🐧 Bird Painting Workshop by Dr RJ Ranjith Daniels will be conducted on April 13th Saturday. It's a complete hands-on to those who are interested in Birds and Paintings. Register at https://aazp.in/bird-painting - Limited Seats. 🐣 Want to learn more about birds? Here is your chance. Sighting Birds along with their Identification tips will be provided in the Workshop on Birds and Birds Identification on May 26. Don't miss this wonderful opportunity! Get Registered! Online Registration is mandatory for all the Workshops. 🦁 Visit Vandalur Zoo to experience the World of Animals with Virtual Reality - A complete package of Jungle Safari and Marine world for the first time in Chennai. Tickets available at the counter. Get an exclusive wild experience with more education on animals and make this summer more exciting.